This year’s show will be headlined by SA favourites Mmatema, Dumi Mkokstad, Samthing Soweto and Xolani Mdlalose. In light of the upcoming Easter season, the Soweto Central Chorus of the Salvation Army will once again bring you a musically world class show at this year’s 4th annual Easter Songs of Praise taking place at the Linder Auditorium on Friday, 12 April. This year, music revellers at large will enjoy a show boasting performances by headline acts such as 2015 Idols finalist Mmatema, award-winning gospel music sensation Dumi Mkokstad, Afro-pop favourite Samthing Soweto and ex-Joyous Celebration lead singer Xolani Mdlalose. “This year, we are elated to have these musical geniuses as part of this monumental event. The Easter Songs of Praise aims to encourage people to find the peace that comes from salvation, through music. It’s important that the messages of hope through our music reaches and touches the lives of everyone who hears us,” said Manzini Zungu, the Musical Director. Founded in 2012, the Soweto Central Chorus is a unique brigade and musical division of the Salvation Army’s Soweto Central Corps. The anointed choir boasts over 80 members who have broken generational boundaries. Since it was founded seven years ago, the Soweto Central Chorus managed to catch the attention of some of South Africa’s upper echelons. In 2016, the choir was invited to perform at King Goodwill Zwelithini’s palace-home to the world-renowned Zulu King. The choir’s core mandate is to minister through music and staying true to this, it has spread the word of God through song in events like the Road to Calvary, the 3rd Easter Songs of Praise 2018, Carols by Candlelight and performances at other Salvation Army Corps. Tickets to the Easter Songs of Praise will be available from Computicket from Tuesday 26 March at a cost of R150 – R200 per person. Mother’s Day ambience created by nostalgic tunes. Photo: Supplied. Stand a chance to win Central Square vouchers if you take the best selfie with your mom. The competition ends on 20 May. Mothers play an irreplaceable role in nurturing everyone around them, and the world has dedicated one day when they can put their feet up and be pampered in return. Boutique shopping centre Central Square at Menlyn Maine honoured mothers in South Africa with the word “Mom” represented in all South African languages in the precinct’s “mood tree”. 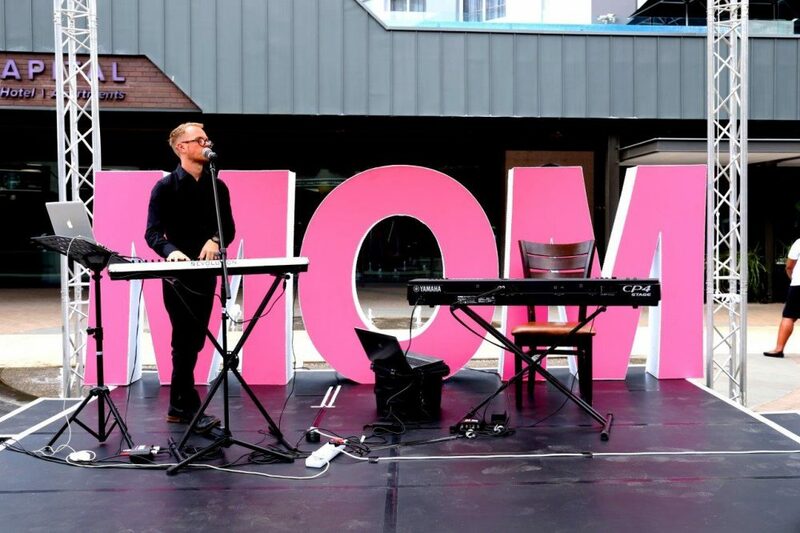 Central Square celebrated the Mother’s Day weekend from 10 to 13 May, but every day of the year is Mother’s Day at Central Square. Moms are honoured and loved for 365 days in the environs of Pretoria’s vibrant green city. Those who missed out on the weekend’s activities can still honour their moms until 20 May at the selfie stage and enter the “Selfie for Mom” competition. The weekend was filled with unforgettable experiences as mothers loaded up on some “me time”. A popular stop-off for kids was the craft zone where children could create unique gifts for that special person called Mom. Children had fun expressing themselves and finding meaningful ways of thanking their moms. The central piazza was pretty in pink with a bandstand playing cool tunes, while musicians created a nostalgic vibe with much-loved classics. The fun and love went on well into the evenings. Alan Hayward crooned his way through a set of vocals Ol’ Blue Eyes would be proud of, while Bogan Pashovski provided smooth keyboards, with Lyndi-Lee Smith and Ayo on vocals, created an ambience to be remembered. The perfect weather added to the pleasure on the piazza as families enjoyed a meal at the outdoor eateries that were packed to the brim. Many visitors attended the spellbinding performances of Dynamo at the Sun Arena, also in the Menlyn Maine precinct.